When you hear wasabi, you probably think of sashimi or sushi. Maybe add toothpaste to that list as well? No, let's not do that. 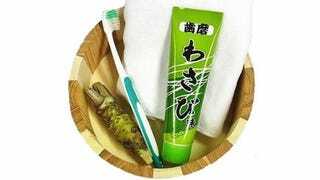 This month, Japanese retailer Village Vanguard is rolling out wasabi-flavored toothpaste. The toothpaste smells like wasabi, it has a wasabi-like texture, and most importantly, it tastes like wasabi. If you've ever wanted to clear your sinus while brushing your teeth, then this is for you. Wasabi toothpaste isn't just silly nonsense, though. Back in 2001, Japanese researchers showed that real wasabi can help prevent tooth decay, but added that a wasabi toothpaste might need "something to mask the pungent taste." Here, that pungent taste is the point. This will never replace more popular (and typical) flavors in Japan like mint, but some people might buy it for a laugh. This toothpaste can be used as a prank (or when someone loses a bet) or, well, as actual toothpaste, but Village Vanguard says not to serve it with sashimi. So don't!